You’ll begin your trip with a two-hour ferry ride from Tsawwassen to Swartz Bay on BC Ferries. Victoria has so many interesting activities to offer, you will have a full day fitting in just a few. On your drive to Tofino, there is a variety of scenery with every bend in the road, from thick forest, to small towns, and spectacular views of the Gulf Islands sprinkled throughout the Strait of Georgia. Tofino and Ucluelet are a magical part of Vancouver Island. Gorgeous shorelines, misty mornings and an abundance of adventure, including hiking, visits to hot springs, whale watching, chartered fishing, boating and surfing is all available to you. A return trip down the winding road to Port Alberni is the only way to return and get to Campbell River. If you didn't already do so on your way to Tofino, stop at Cathedral Grove, near Port Alberni to take a walk among huge old-growth rain forest. Take time out today to explore Campbell River. Consider taking a short ferry ride across to Quadra Island. From Campbell River, Highway 19 passes through more lakes and bays before skirting inland toward the small logging and farming community of Sayward. Today you’ll head to Prince Rupert via a ferry – check the schedule online and make a reservation as it is necessary for those travelling in RVs. Take more time out today to relax and enjoy your spectacular surroundings in Prince Rupert. Today's a very long day of driving if you decide to do this stretch all at once. You may decide to break this into a two-day journey, overnighting at a campground en route, before continuing on to Prince George the following day. From Prince George, head east on the Yellowhead Highway to the scenic community of McBride, nestled in Mount Robson Valley. Awake today to trilling birdsong and views of the massive peaks which crown the horizon in every direction. Start your day with the tranquility of Pyramid Lake and the reflection of Pyramid Mountain in the surrounding water. Take a drive today out to Maligne Lake, 44km south of the Jasper town site. This emerald green lake is set amongst the snow-mantled peaks of the Front Range and stretches for nearly 22 kilometers. The 230-kilometre Icefields Parkway ranks among the great high roads of the world and commands some of the most majestic scenery in the Canadian Rockies. It runs between Jasper and Lake Louise. Before leaving Lake Louise today and arriving in Banff, take an early morning trip back up to the lake where, on a fine day, the mountains cast tranquil reflections into the lake. Begin your day in this mountain paradise with a hike east along the Bow River valley to the hoodoos. The journey to Calgary from Banff is a short one so take your time to explore along the way. On your journey to Waterton today, you’ll take a scenic route that passes Chain Lakes Provincial Park and skirts the foothills of the Canadian Rockies before reaching Frank Slide. Waterton Lakes National Park has over 255 km (191 mi) of trails in the Park, ranging in difficulty from short strolls to steep treks of several days' duration. Hiking is the best way to experience this paradise. Today you’re heading across the border to Glacier National Park in Montana. Be sure to check road openings before crossing the border. The Kootenai (in the US) and Kootenay Rockies (in Canada) provide some spectacular mountain scenery as you drive today. With a relatively short distance to travel today, there should be ample time to explore points of interest along the way. Spend your day exploring Osoyoos and the region. From winery tours, museums and walks, enjoy the beauty and warmth of this gorgeous Okanagan town. Today’s drive from Osoyoos takes you through spectacular scenery as you leave the Okanagan and arrive on the coast in the city of Vancouver. You’ll begin your trip with a two-hour ferry ride from Tsawwassen to Swartz Bay on BC Ferries. If the weather is fair, there is nothing better than to stand out on deck while navigating the narrow passages between the Gulf Islands. You enter a very narrow channel with a close view of Galiano Island on the north and Mayne Island on the south side, coming out on the south-west side of Salt Spring Island, winding your way toward Swartz Bay. As you approach the Bay, the island on the south side of the ferry is Pender Island. As you drive out of the ferry terminal, you join Highway 17 into Victoria. About seven minutes into your drive, you’ll arrive in Sidney on your left. Turn into this beautiful, seaside town and enjoy the man books and coffee shops, whale watching and strolling down the pedestrian-friendly main drag. Victoria has so many interesting activities to offer, you will have a full day fitting in just a few. Butchart Gardens, south of Swartz Bay, on Highway 17A, is world-renowned and is a splendid, restful place to wander around and enjoy the day. Drive into Victoria and spend the next two days wandering in old downtown and the waterfront. See the Parliament Buildings and have high tea at the Empress Hotel. Close by is the Royal BC Museum and IMAX Theatre. If you enjoy historic houses, take an easy eight-minute drive from Victoria's Inner Harbour, up Fort Street, right on Joan Cresent to visit Craigdarroch Castle. Victoria is also famous for whale watching. Make sure to check out the CanaDream app to take advantage of discounts. While downtown, wander over to Beacon Hill Park for a picnic or stroll. On your drive to Tofino, there is a variety of scenery with every bend in the road, from thick forest, to small towns, and spectacular views of the Gulf Islands sprinkled throughout the Strait of Georgia. The Port Alberni to Tofino leg is a very narrow, winding road and will likely be quite a slow portion of the day’s drive. On your way up the Trans Canada Highway, Bamberton Provincial Park is a worthwhile stop for a scenic break. Duncan, nestled in the Cowichan Valley, is also an interesting stop. Part way up the west side of the island, you will come to a town named Chemainus. This is a pretty little seaside town with different murals painted on the sides of many downtown buildings. Branching off the Trans Canada Highway onto Highway 4, just north of Nanaimo, you will be on your way to Port Alberni and Tofino. For another scenic break, you may want to stop in either Little Qualicum Falls, McMillan or Sproat Lake Provincial Parks. As you continue, stop in Coombs to see the goats that graze on the roof of a local establishment, and stop at Cathedral Grove (a must! ), near Port Alberni. Walk among huge old-growth rain forest with trees up to two to three metres thick. Tofino and Ucluelet are a magical part of Vancouver Island. Gorgeous shorelines, misty mornings and an abundance of adventure, including hiking, surfing, visits to hot springs, whale watching, chartered fishing, boating and surfing is all available to you. There are a few sea-kayaking and canoeing companies that offer lessons and day trips, as well as longer tours. These trips offer storytelling, knowledge-sharing about plant life and survival skills, and a day out on the water. And, if you are passionate about playing golf, there is a golf course overlooking the ocean very close to Parks Canada's Green Point campground. Continue on eventually heading north through the Lighthouse Country communities of Qualicum Bay, Bowser and Deep Bay on your way to Campbell River. Follow the Oceanside Route (19A) through the charming communities of Fanny Bay, Buckley Bay and Union Bay, making sure you stop to sample the world famous oysters in Fanny Bay. At Courtenay, you may like to take a short diversion off Highway 19A into Comox. Other places of interest include Miracle Beach Provincial Park, where porpoises and hair seals can often be seen near the mouth of black creek. Killer whales are sometimes spotted from here in the Strait of Georgia. From Miracle Beach Provincial Park, it's a short drive to Campbell River. If Quadra Island doesn't appeal, how about taking a wildlife and cultural tour with Aboriginal Journeys? This first nations wildlife and cultural tour operator offers whale watching, grizzly bear and wildlife viewing, native history and culture, nature photography and eco-adventure tours in Campbell River. Should you prefer a day just exploring the area, take a drive down to Gold River or to Strathcona Provincial Park. A day trip to Strathcona gets you into an unparalleled natural wonderland of vast forests, great lakes, alpine meadows and challenging peaks. From Campbell River, Highway 19 passes through more lakes and bays before skirting inland toward the small logging and farming community of Sayward. If you have time, take a side trip at Sayward Junction into Sayward for a visit. If you'd like to add another day or two to this leg of your journey, we suggest you take a side trip into historic Telegraph Cove. Much of the town is built on stilts, raised above the water, and linked by a wooden boardwalk. With a permanent population of around 20 people, Telegraph Cove has reinvented itself as a hub for ecotourism. It is the departure point for a slew of outdoor activities including whale watching, bear watching, fishing, ocean kayaking, caving, diving, hiking and aboriginal cultural touring. If you decide to continue straight through to Port Hardy, aim for an early evening arrival. Consider spending an additional day in Port Hardy and let Cove Adventure Tours guide you on hikes to remote white sandy beaches and into the North Island backcountry, exploring caves and secret coves. Today you’ll head to Prince Rupert via a ferry – check the schedule online and make a reservation as it is necessary for those travelling in RVs. It’s a full travel day so, once on the boat, enjoy the sailing with a good book, game of cards or take in the scenery. Many campgrounds in Prince Rupert say open late for ferry arrivals. We suggest you make a reservation with your chosen campground. Take more time out today to relax and enjoy your spectacular surroundings in Prince Rupert. Visit the North Pacific Fishing Village, a National Historic Site, and take a tour of the most complete cannery remaining of the remote villages that once dotted the West Coast. Other places worth visiting include the world class Museum of Northern BC, the Kwinitsa Railway Museum and the Firehall Museum. Spend a quiet moment watching the boats along the waterfront - you may find yourself rewarded by a glimpse of a harbour seal, or one of many species of seabirds. On rare occasions you may even spot humpback or killer whales. Points of interest between Prince Rupert and Prince George include Ksan Historical Village, 50 million year old fossils at Driftwood Canyon Provincial Park, and Fort St James Historic Site. On your way south, stop in Smithers where Bulkley Adventures can take you on a Heli Tour excursion deep into the mountains surrounded by glacier covered peaks or on a thrilling jet boat tour. Prince George is known as an all-season playground. With over 120 parks and more than 1600 nearby lakes and rivers offering endless opportunities for fishing, boating, hiking, wildlife viewing and camping, Prince George is a place for both indoor and outdoor discovery. From Prince George, head east on the Yellowhead Highway to the scenic community of McBride, nestled in Mount Robson Valley. The exceptional scenery here draws hikers, anglers and white water enthusiasts. Enjoy an easy walk around this thriving artist community or try heli-hiking, heli-skiing or snowmobiling. Continuing east from McBride, take a short diversion off highway 16 into the friendly town of Valemount. Here you can canoe meandering streams or simply take in the nature around you. Late summer brings the world's longest salmon migration to the spawning ground of Swift Creek in nearby George Hicks Regional Park. Travelling back to highway 16, you rejoin the Yellowhead Highway en route to Jasper. Pass through Mount Robson Provincial Park - named after the highest peak in the Canadian Rockies - a jagged, snowy pinnacle rising 3,954 m (12,972 ft) above largely undisturbed wilderness. From Mount Robson, it's an easy one-hour drive through to Jasper where you should plan to spend at least two full days. Advance reservations at the National Park campgrounds are strongly recommended during the peak summer season. Spend some time today wandering around Jasper and visiting the variety of stores along the Main Street. RV parking is available close to the downtown area. This afternoon, head out to the Jasper Skytram. The experience of being gently transported into Jasper National Park's alpine tundra will captivate all ages. Stroll the boardwalks, viewing the interpretive plaques, and watch for wildlife. Tonight you may like to take a trip up to Miette Hot Springs. Open between mid May and Labour Day, these hot springs consist of two pools kept at about 40 degrees Celsius. An alternative to the hot springs might be a visit to The Jasper Planetarium, the world's largest astronomy park, where you can check out the largest telescope in the Rockies and get the show of the heavens in the "Jasper Dark Sky Preserve". Take a drive today out to Maligne Lake, 44km south of the Jasper town site. This emerald green lake is set amongst the snow-mantled peaks of the Front Range and stretches for nearly 22 kilometers. At Maligne Lake, take the 90-minute scenic cruise to world-famous Spirit Island. On the way back from the lake, stop at Maligne Canyon. Parks Canada has developed a self-guided interpretative trail along the canyon with signs describing the geological history of the area. If you fancy having an active day, find a local hike or connect with a rafting company. Download the CanaDream app to receive discounts from our partners on activities. And, if you’d like to relax, drive out to the Fairmont Jasper Park Lodge, surrounded by captivating mountains and sparkling lakes, to enjoy the many activities, including the spa, at this historic resort. The 230-kilometre Icefields Parkway ranks among the great high roads of the world and commands some of the most majestic scenery in the Canadian Rockies. It runs between Jasper townsite and Lake Louise. Allow yourself a full day to enjoy this three-hour drive so you can stop along the way. Make Athabasca Falls the first of those stops. Also keep your eyes peeled for Bow Summit, which at 2,068 m (6,785 ft.) above sea level, is the highest point on the parkway and offers one of the best mountain panoramas in the world at Peyto Lake viewpoint. The Icefields Parkway ends in the picturesque village of Lake Louise. Located in the Bow Valley, the village provides shopping, accommodation, meals, automotive services and tourist information. Four km (2.5 mi) above the village is the lake itself, dominated by the majestic Victoria Glacier. Near Lake Louise, visit emerald-coloured Moraine Lake. Surrounded by a panorama of ten glaciated summits known as the Wenkchemna Peaks, Moraine Lake is found at the base of the Continental Divide, the geographic point where all waters flow either west to the Pacific Ocean or east to the Atlantic Ocean. Before leaving Lake Louise today, take an early morning trip back up to the lake where, on a fine day, the mountains cast tranquil reflections into the lake. Consider driving up to the Lake Louise Ski Resort and taking a ride up the gondola for more incredible mountain views. From Lake Louise, take the Bow Valley Parkway and look for the turn-off to Mount Eisenhower where you can do some hiking. According to Indian legend, this 2,862 metre turreted peak is the home of the Chinook - a warm, dry winter wind that sweeps out of the Rockies to melt snow in the foothills and prairies. Next stop along the road is Johnston Canyon. Proceeding up the highway you will find a nine-kilometre drive that skirts the shores of the three Vermilion Lakes. The surrounding wetland, a marshy area of the Bow River, is rich in plant and animal life. Ringing the lakes are Sulphur Mountain, Mount Rundle and the peaks of the Sundance Range. An incredible view. You will soon enter the town of Banff, which is a year-round recreation center for tourists, horseback riders, skiers, hikers and mountain climbers. Begin your day in this mountain paradise with a hike east along the Bow River valley to the hoodoos (eroded rock formations by the river’s edge). Hike up Sulphur Mountain and take the gondola down, then take a soothing dip in the Banff Hot Springs at the base of Sulphur Mountain. Or you could go to the west side of town and rent a canoe and paddle northwest along the creek to the Vermillion Lakes. If you’re desiring a more relaxed day, enjoy the beautiful town of Banff and walk the streets to shop, dine and explore local art, food and treats. Be sure to check out the CanaDream app to take advantage of any partner discounts on activities and experiences while you’re here. Make sure you take your time and stop in Canmore. From mountain bike tours, river adventures, including floating and rafting trips, as well as caving and spectacular helicopter tours, there is so much to do in this town. Your next stop along the way if you have time is Kananaskis where you can picnic, visit the village or stay for a night if you have extra time. Overnight in Calgary - use our CanaDream app to receive a discount at one of many partners in this sprawling city. Today you’ll leave Calgary and take Highway 2 to High River before heading west to Longview where you’ll join Highway 22 south. This scenic route passes Chain Lakes Provincial Park and skirts the foothills of the Canadian Rockies before reaching Frank Slide. Turn east at the junction of Highways 22 and 3 to Pincher Creek. From Pincher Creek it's only a short drive south into Waterton National Park. This is an uncrowded natural paradise, where people, wildlife and nature peacefully co-exist all year long. For a spectacular view over Waterton Village and the lake, there's a short, moderately strenuous hike to the overlook at the top of Bear's Hump - 2.8km round trip with an elevation gain of 225m. Or, rent a canoe or kayak at Cameron Lake for some water fun. Waterton Park offers a huge variety of fishing experiences, too. Take a trip up to Red Rock Canyon - a 16 kilometer drive from Waterton Village, where the layers of red and green coloured minerals offer a brilliant contrast to each other and the lush surroundings. If you're travelling between early June and late October, the easiest way to get from Waterton to Glacier National Park, Montana, is through the Chief Mountain border crossing. Between November and the end of May, the next closest port of entry to the USA is at Carway, south of Cardston. From the Chief Mountain border crossing, it's a spectacular drive south, through the small town of Babb to St Mary. St Mary is at the eastern end of the Going to the Sun Road, one of the most amazing highlights of Glacier National Park. To truly appreciate the Going to the Sun Road, you should allow enough time to travel it in each direction. Take a guided tour or use the Park shuttle to experience this spectacular scenic highway. After completing the road in both directions, you will be back in St Mary. 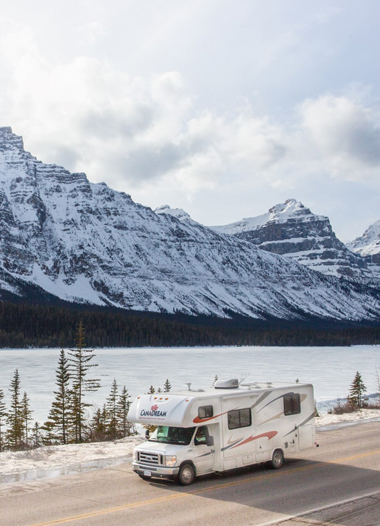 As you are unable to take your RV over the Going to the Sun Road, you will need to continue your journey around the perimeter of the park to get to your next overnight stop in West Glacier. Allow a couple of hours to get there. If you're travelling outside of the peak travel months of July and August, we suggest you check to make sure the Going to the Sun road is open before crossing the border into the USA. The Kootenai (in the US) and Kootenay Rockies (in Canada) provide some spectacular mountain scenery today as you drive west on Highway 2 through Kalispell and Libby to Moyie Springs. Just east of Moyie Springs is the junction of US Highways 2 and 95 where you head north towards the border crossing at Porthill, Idaho. US Highway 1, becomes Canadian Highway 21 at Rykerts, 11km south of Creston, BC. Nestled in the Creston Valley, between the Selkirk and Purcell Mountains, the attractive town of Creston presides over a broad and fertile river valley where the Kootenay River comes home to Kootenay Lake. At Creston, you have the choice of saving time on your journey by taking Highway 3 west towards Osoyoos or travelling up the east side of the Kootenay Lake on Highway 3A. If you have the time, we recommend you take the second option. On this route, beautiful scenery, sandy beaches and panoramic views of the Selkirk and Purcell Mountains are sure to delight both young and old. At Kootenay Lake, you’ll take the Kootenay Lake Ferry to Balfour. After disembarking the ferry at Balfour, you may like to take the road left up to Ainsworth Hot Springs, a few kilometres north of Balfour. If not, continue on to your destination for today, Nelson. With a relatively short distance to travel today, there should be ample time to explore points of interest along the way. You could spend an extra day at Christina Lake, known as the warmest tree-lined lake in Canada or stop in the town of Grand Forks and stretch your legs. Located in the heart of the Kettle Valley, surrounded by the protective mountains of the Okanagan and Kootenay regions, is the small village of Midway. Worth visiting here is the Kettle River Museum, located at Mile 0 of the Kettle Valley Railway. From Midway to Osoyoos, Highway 3 skirts the Canada/US border until it reaches Osoyoos in the heart of BC's Desert Wine Country. Located at the northern-most tip of the Sonora Desert, Osoyoos is one of the largest fruit growing areas in Canada. Take a dip in Lake Osoyoos, Canada's warmest lake, rent a boat from the Marina, celebrate thousands of years of Okanagan First Nations habitation on desert lands at the Nk'Mip Desert Cultural Centre or just relax in some of the highest average temperatures in Canada. If you're a wine lover, a winery tour in this region is a must! Consider a drive up Highway 97 into the heart of the Okanagan Valley. You can travel as far as Shuswap Lake area before returning to Osoyoos through Kelowna, Peachland and Penticton. Don’t forget to check out your CanaDream app for partners in these areas that offer discounts. From Osoyoos, Highway 3 takes a south-west toward the US border before it takes a sharp turn again north to Keremeos. The Keremeos area boasts some of the most spectacular scenery in North America. Located just 30 minutes west from Keremeos is Cathedral Lakes Provincial Park, with its amazing towering mountains and their waterfall veils. If you decide to spend the day hiking in Cathedral Lakes Provincial Park, you may like to add a day to your journey and spend the night in Hedley. Nestled in the foothills of the Cascade Mountains at the junction of the Tulameen and Similkameen rivers is Princeton, a town rich in history and filled with tales from the early days and adventures of the gold rush era. The next leg of your trip will take you through mountainous terrain to Manning Provincial Park before reaching the town of Hope. Join the Trans Canada Highway as you leave Hope and travel through the rich farm country of the Fraser Valley. Continuing along Highway 1, the farm country begins to disappear gradually as you approach the cities that make up the Greater Vancouver region.